I cut along the turquoise line and sewed the new side and shoulder seams together. 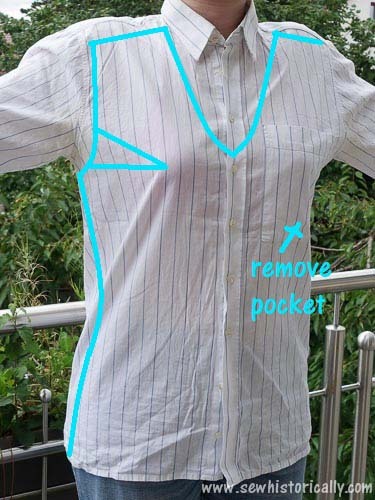 Then I removed the pocket and added darts. Now the shirt fits much better. Instead of self-fabric bias binding, I finished all raw edges (the V-neck and armscyes) with my faux 1920s picot hem. What a fun refashion! I might just have to find me a men’s shirt to cut up, and redo. Thanks so much, Julie! 😀 You’re welcome to steal my edging idea! You’re welcome to drop by fora cup of inspiration! Thank you so much for linking up to #Fakeituntilyoumakeit. This post is great…so inspiring. I love the new-look shirt, especially tied at the waist. What a great idea! Thanks for sharing this with us at the Homestead Blog Hop! Lovely and cool for a hot Summer. Looks good tied at the front, too.